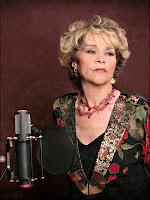 Tickets for Etta James & The Roots Band at George Wein’s JAZZ FESTIVAL 55 go on sale tomorrow, May 13, at 10:00 am HERE. Opening for the legendary vocalist will be the Howard Alden/Anat Cohen Quartet. The concert is set for Friday, August 7, at 8:00 pm at The International Tennis Hall of Fame at the Newport Casino, 194 Bellevue Avenue.